The horizontal gaze nystagmus (“HGN”) test is one used by Bryan police officers to establish probable cause to arrest a person for DWI. In theory, when used in combination with other field sobriety tests, HGN supposedly helps police officers correctly distinguish suspects who are under the influence of alcohol from those who are not. The test is based on the fact that alcohol affects the automatic tracking mechanisms of the eyes. Alcohol supposedly slows down the eyes’ ability to rapidly track objects and causes the eyes to oscillate, or “jerk”, before they normally would in a sober person. Alcohol supposedly stimulates the nerve endings, making nystagmus more pronounced in intoxicated persons. As a person’s blood alcohol concentration increases, the eyes will “jerk” sooner as they move to the side. The HGN test claims to gauge intoxication by measuring the involuntary oscillation of the eyes. The aggressive Bryan DWI defense lawyer must challenge the ability of trial courts to take judicial notice of the reliability of HGN testing as well its application in the specific case on trial. 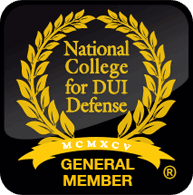 The DWI defense lawyer must consider presenting expert testimony challenging the use of HGN by showing it is not scientifically validated. Furthermore, the lawyer must attempt to show at best, the HGN is only circumstantial evidence that a person may have used alcohol or may be intoxicated.